You know the joke about assumptions. They make a you-know-what out of "u" and "me", right? Well, that old grade school laugh-inducer couldn't be truer when applied to the world of private label rights content. Let's talk about Swiss army knives again for a moment. They're not all the same. There's a small version that just has a few different blades. There are standard ones that have many of the extras. There are a few big ones that have everything from a built-in pair of scissors to a 42" color television. Okay, maybe they don't have a TV. But they do have awls and nail files. In any case, not all Swiss army knives have the same set of options. So it is with PLR content. Not all PLR packages come with the same rights attached. While some packages may limit your use of the materials, others will let you do just about anything you can dream up with them. When you don't understand the terms, you run three different risks. First, you might miss out on some great opportunities you didn't know you had. You may be entitled to take a few extra bites of the apple. You might even be allowed to sell the apple. It pays to know. Second, you might accidentally step over the line with respect to usage. It's not cool to act outside of the license. Is there a huge risk of getting caught? Not necessarily (although it does happen and it's rarely fun when it does). However, it is unfair and it represents a violation of an agreement you made. For those of us who take such tings seriously, that's meaningful regardless of whether you get busted. Third, you might wrongly assess the value of a PLR package. You may not have noticed the fact that the vendor is already letting people peddle the whole thing on eBay, which will probably have an immediately negative impact on its value. There are many different possibilities. The solution to this one is nose-on-your-face obvious. First, understand the different kinds of rights and learn how to read a PLR license so you know with certainty what can and cannot be done with the content. While PLR licenses can sound a little like gibberish to a newbie, everyone can get a grip on them with a little research. Second, always take time to read the entire license for each purchase and file it in your computer according to it's license. This will take you no more than thirty seconds, yet it will help you to duck all of three of the common goofs associated with neglecting the terms and conditions of your PLR purchase. Something weird happens in the world of private label rights. For some reason, people tend to suddenly forget some of the most important basics of Internet marketing. The last of our "seven deadly sins" is a perfect example of this bizarre phenomenon in action. We all know that proper keyword use is critical to successful search engine optimization. It's one of the first concepts with which Internet marketers grapple. It remains in the forefront of their mind every time they pursue organic search traffic. The quest for keyword discovery and assessment has led to literally hundreds of guides, strategies, tip sheets and software programs. The IM world is justifiably obsessed with uncovering the keywords that will generate substantial traffic. It's a top priority for everyone who hopes to see search traffic. Yet for some unknown reason, many marketers lose control of their faculties when dealing with private label rights content. They go through the process of editing and revising the content that they'll be using on web sites, blogs and in article marketing efforts to insure originality (at least those who are using PLR content the "right way" does this). They tweak the content to maximize its value to the end user and to improve its readability. And then they neglect to optimize the content for their keywords! When vendors create private label rights content, they often churn out those articles without any consideration of specific keywords. They're far more interested in covering the topic area than they are in isolating specific keywords. After all, they may have no idea whatsoever about the keywords individual clients may be targeting. So, when marketers fail to optimize their content for specific keywords, they're basically conducting an SEO Jello toss. They're throwing that content out there and hoping that some of it sticks to Google. Sometimes it might. More often than not, it doesn't. The fix? Take out that solid gold list of keywords you've devised for the project and put them to use. Get the keywords into the title and edit the articles in a way that insures they pop up within the text at appropriate intervals. When you write or commission custom content, you undoubtedly take keyword use and density into account. You shouldn't treat PLR content any differently. Appropriate keyword use is your ticket to better search engine performance. Don't forget about that core principle of Internet marketing just because you're dealing with private label rights materials. Private label rights content is a powerful asset. If you use it correctly, it can dramatically improve the performance of virtually any Internet marketing project. Unfortunately, countless buyers of PLR content fail to use it at all, and those who do... often make serious mistakes in the process. If you want to get the real benefit from PLR materials, you need to learn how to use it the "right way" and how to "correctly" integrate them into your business model. 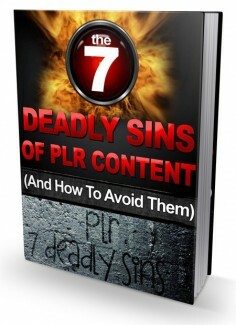 Avoiding the "seven deadly sins" of PLR content is a great way to start. If you can avoid these common blunders, you'll be well on your way to making PLR a valuable part of your business.